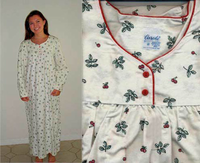 1 - flannel nightshirt/s $39.90 ea. 2 - flannel nightshirt/s $37.90 ea. Our classic, soft mens cotton flannel nightshirt for men and women is made from premium 100% ring-spun cotton and features a Henley-style 3 button-front placket, full length sleeves, and a chest pocket. It is offered in five full cut sizes to ensure a perfect fit. Our generous length allows for the expected shrinkage of 2-4 inches in a 50 inch length from shoulder to bottom hem. The medium weight plaid flannel fabric is yarn dyed (5 oz. 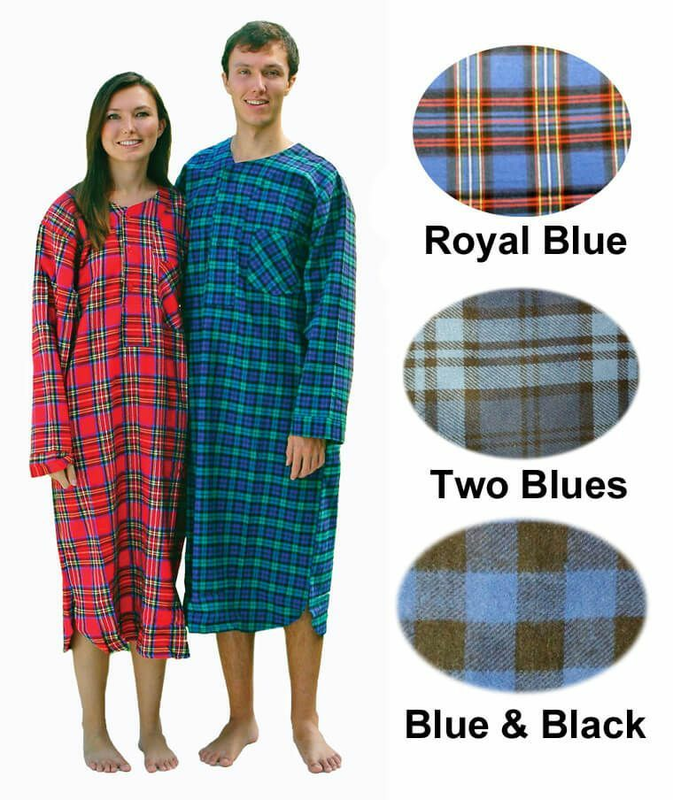 per square yard) for long-lasting vibrant color, the patterns include Black Watch plaid (green, navy, and black plaid), Stewart Plaid (Red and Black plaid), Royal Blue Plaid (Royal Blue, Red, and Black plaid), Two Blue Plaid (Light Blue, Dark Blue, and Black plaid), and Blue and Black Plaid (Royal Blue and Black plaid). Premium quality from India. Durable for machine wash/dry, do not use bleach or hot water. Unisex sizing: For ladies, choose one size smaller than usual. For men, choose usual size. Size 2XL is $2 more per nightshirt. 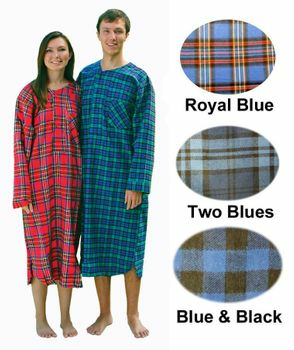 MEASUREMENTS: Our Flannel nightshirts are all quality made in the India and have the above measurements (before shrinkage - shrinkage would probably be 1 inch across the chest and 2 inches in length.